USB flash drive is a common storage device to store pictures, documents, messages etc. because they are small size, durable and easy to use. However, due to accidentally deletion or formation, system failure and corruption, virus attacks or other reasons, it is easy to lose data from the USB drive.especially when data has not been backed up. Therefore, you will need a Best USB data recovery software to restore deleted files from USB flash drive. Here you can use Bitwar Data Recovery to get the deleted files back before that space is overwritten by new data. Bitwar Data Recovery is packed with the best USB data recovery algorithms that cover NTFS, FAT32, EXT, ExFAT, HFS+ and other file systems. Undelete your erased data on system disks, external devices, memory cards, USB drives, and other computers. And it is not just USB flash drives, but any storage device you can connect to your PC can be scanned for USB data recovery. how to recover deleted files from USB flash drive? 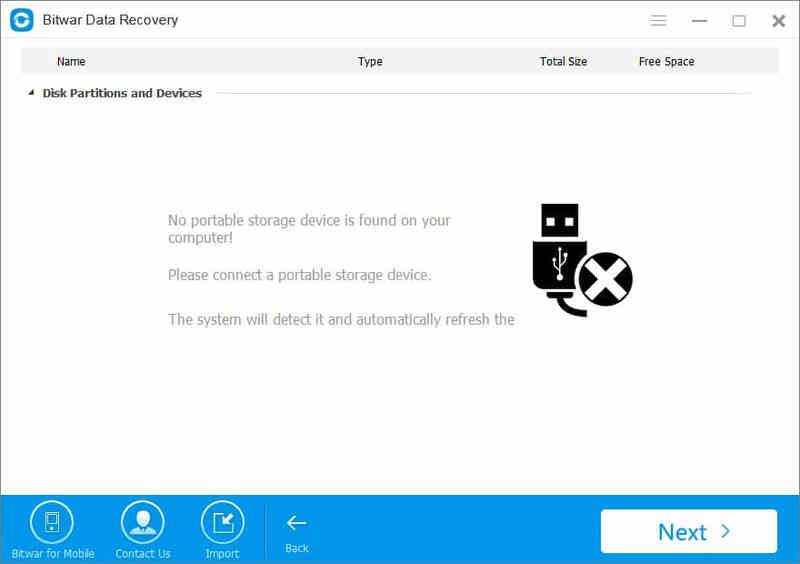 You can free download and install Bitwar Data Recovery Software in your PC (http://www.bitwar.net/data-recovery-software/). Launch Bitwar Data Recovery and Connect the USB flash drive to PC. To recover deleted files from USB flash drive, you need to select “USB/Memory Card Recovery”. Please make sure your USB flash drive have connected and select it, then select several file types. The Bitwar Data Recovery supports all file types: pictures, videos, audio, emails, documents and others.finally click on the button "Next" to start scanning the USB drive . Bitwar Data Recovery will start scan quickly. During the scanning process, you can pause your recovery progress temporarily and resume later. Also you are able to Export and import scanning results if necessary. After a scan,you can make a selective recovery with Preview before recovery to determine which one you want.when you determined, Choose the data and click "Recover" button. Here you should save all the recovered files on computer to avoid data overwriting. Please Note: DO NOT save the files into your USB flash drive where you lost them. Please select a safe folder on your computer to keep them. Following this action, the deleted files has been recovered. By the way, all lost data could be simply restored. It also supports memory card data recovery, CF card data recovery, external hard drive data recovery, memory stick data recovery, etc.